thebackingboardfiles: Toycon 2016 was BIG fun! 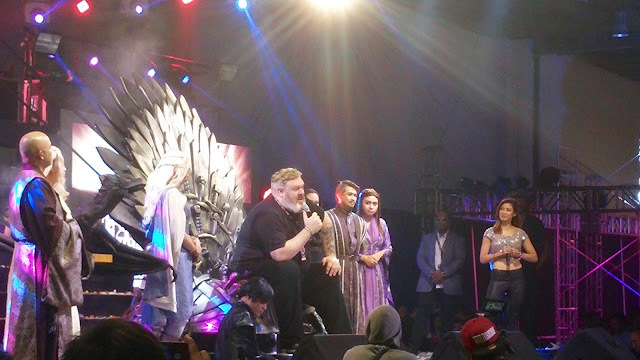 Irish actor Kristian Nairn who played "Hodor" in "Game of Thrones" was one of Toycon 2016's biggest attractions. This was the biggest Toycon yet. Make it the tallest. Six-foot-eleven Irish actor Kristian Nairn who played “Hodor” the gentle giant in “Game of Thrones” was a big hit — pun intended - at the Toycon + Poplife Fan Experience edition of the country’s biggest toy and pop culture event held at the SMX Convention Center at the Mall of Asia, Pasay from June 10-12. Nairn’s character of “Hodor” bit the dust literally at the hands of the White Walkers a few weeks ago after playing a recurring role of the Stark family’s silent protector for five seasons. The Irish actor was jovial despite the heat, and candidly talked about the success of the fantasy drama series that has gripped audiences for the last several years and answered questions from fans. “Hodor” wasn’t the only star present. Dean Cain who played Clark Kent/Superman in Lois and Clark: The New Adventures of Superman for four seasons was also present as were other actors such as Daniel Logan who played a young Boba Fett in the Star Wars prequels. 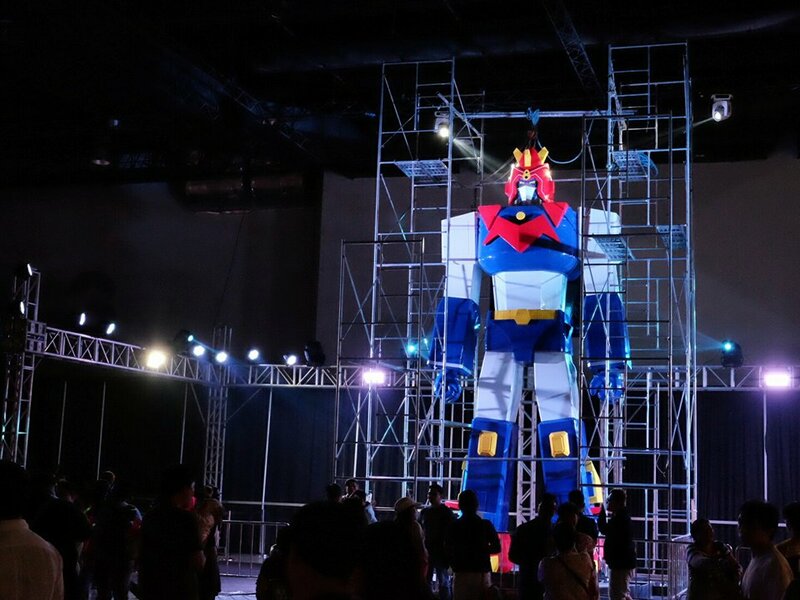 And there was that massive Voltes V display. How tall was that? This is probably the first cartoon to singularly hold the collective breath and attention of an entire generation that to this day, that anime holds good memories! Francis Abad who rushed to the SMX Convention Center late in the afternoon of June 12, the final day, said, “The Voltes V statue was the first thing I saw when I got there. As early as then, I knew I was going to have fun. And then when I saw the Stan Lee exhibit, it was great probably because I am a fan. It had a museum-like display that was a nice touch." What added to the excitement of this year’s Toycon was its partnership with the Salt Lake Comicon & FanXperience that really ramped up the star power of the fan event. Previously, local entertainments and little known artists made guest appearances. Fan favorites Nairn and Cain are massive attractions while Logan along with “Twilight” werewolves Bronson Pelletier and Kiowa Gordon are welcome additions for the uber geek fans. 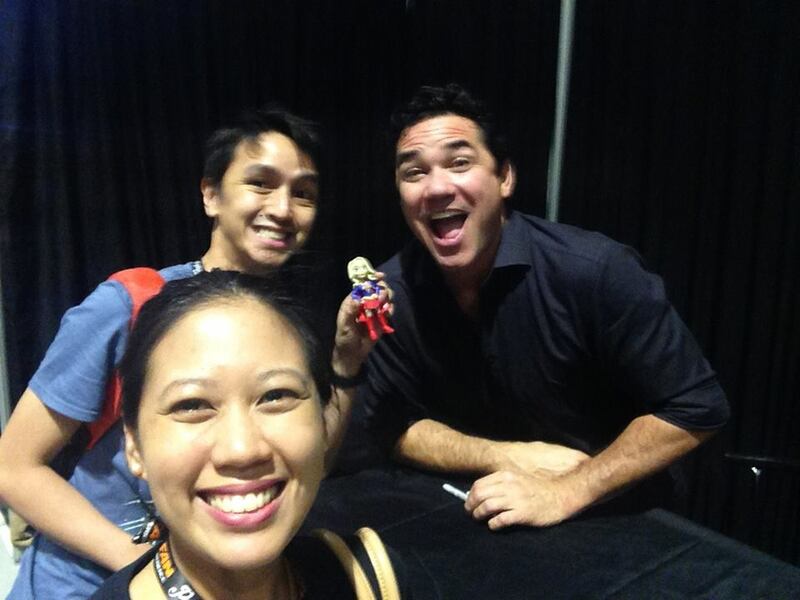 JA Lukban and girlfriend Kamla with actor Dean Cain. Toycon patron JA Lukban said that he enjoyed meeting Cain who talked about missing his old television series and what a blast he is having being a part of the cast of 'Supergirl'. “I asked him what significance will his role have as the build up from last season was good,” related Lukban. “He can’t say anything as expected. But he did say he missed played Clark Kent and that he will appear in more episodes in the second season of ‘Supergirl’”. 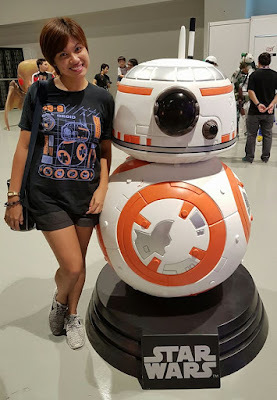 Meg Siasoco and the BB8 Pop! Toy collector Meg Siasoco also had a blast, "ToyCon 2016 is bigger, more interesting than before since it has a bigger venue and they invited International artists. It was good to see them even though I did not get a VIP or Legendary ticket. The Encantadia reveal was spectacular as well. The Votes V display was very impressive since this is the biggest one to date if I am correct. Mindstyle and Pop Life released the Japan based characters of Legends and Creatures line of Funko Pop. Actually, as a Funko collector, I enjoyed the con because there are lots of Pops around. But if you are not a Funko collector, there might be a bit of disappointment since not all toys are in there." The Philippine Outpost of the 501st Legion. The 501st Legion is the name of the fan group that was started in 1997 by Albin Johnson and Tom Crews that dressed up in highly accurate Stormtrooper and later Sith Lord gear that has expanded to some 8,000 members worldwide. For Toycon, they have a Stormtrooper and Boba Fett character for your own selfie delight. The co-creator of the Marvel Universe is unable to come over. I know his last comic convention will be at the NYCC later this year. This exhibit is the closest one we will ever get to see “the Man” who has co-created many of today’s modern pop culture heroes from Spider-Man, the Fantastic Four, Iron Man, the Hulk, the X-Men, and many more. On display are comics, original art work, signed movie props, and other collectibles associated to the face of Marvel Comics. And there’s the Toycon 2016 exclusive of Stan Lee Guan Yu Funko Pop that costs P750! The re-telling of this beloved fantasy teleserye is set to air next month, July, over GMA7. And what a way to help promote this new series as it features new stars who aren’t like the previous edition’s star-studded cast. The attention to detail in the exhibit was marvelous. Makes you eager to catch this new series. I though that this small “kiosk” was cool. It had DVDs and other paraphernalia related to the films under the TBA stable from “Bonifacio” to “K’Na” to "Heneral Luna”. The life-sized toy figure designs of NBA stars was one of the more popular sites for selfies and photo ops. It took me a day to realize that these designs were the NBA Mindstyle Series by Korean toy maker Coolrain Lee. He wasn't there when I passed by on Day Two but during Day Three, the man was there! Lee, who didn’t have any formal art training is a genius. And his NBA figurines catapulted him to another level of stardom and recognition! It sure was a geek moment to meet him. The long-time favorite of Filipinos who were weaned on the 1980s anime explosion. The giant statue is awesome and perfect for photo ops! Pat Lee and Arthur Suydam in the house! It was nice to see Pat Lee and Arthur Suydam. Between the two, I am a fan of the latter having read his Adventures of Cholly and Flytrap in that old Marvel fantasy magazine, Epic Illustrated. Suydam also did those now famous Marvel Zombies comics. Comic books and graphic novels on sale with some prices at 80% off! Can’t beat that. The numerous toy displays — the Statues and Collectibles Alliance PH in particular!